The POSGuys.com Value POS System has reached end of life. It has been replaced by the POSGuys.com NEW Low-Cost Retail System. This product replaces the older POSGuys.com Starter POS System. The POSGuys Value POS System is designed to provide your business everything it needs to run smoothly at the best value. 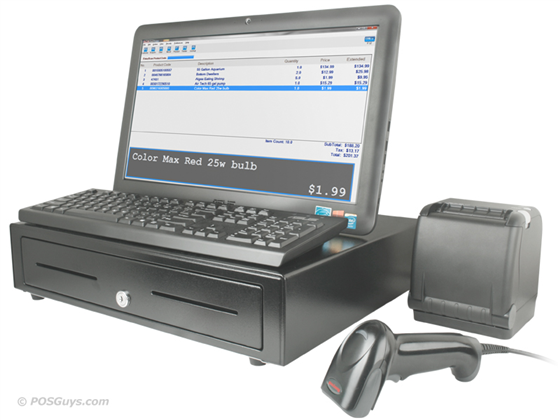 No more squinting to read your small monitor, the Value system comes with a 19" widescreen LCD computer with pos software preloaded on it to make your set up as easy as possible. The computer sits nicely on top of the 19" rolled steel cash drawer taking up minimal counter space. To ensure the best products at the best prices, we added in the newest POS-X thermal receipt printer that prints 3" receipts quickly. For quick scanning, Honeywell's ergonomically designed pistol grip scanner makes for a nice addition to your system. 18.8" x 15.2" x 4.3"
Find it faster! Click here to compare Value POS System models by feature.